Summertime is an easy time for me to get off my regular routine of menu planning. It seems in the winter we stick more to a schedule but summer brings about a more flexible and changing schedule. Along with that, I find myself getting out of planning meals like I do when we're cooped up in the winter months. I don't like it when I do this because it takes up more time and costs me more money when I don't meal plan. I have some simple tips that will hopefully help you to stick with meal planning over the summer. 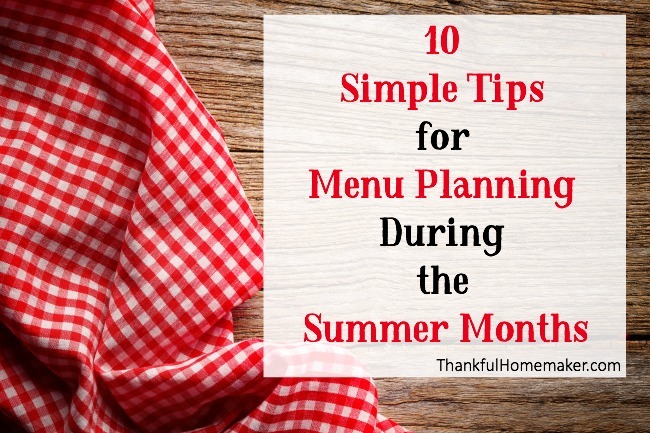 Menu planning is a time and money saver and I don't know about you but I would sure like to have more time to enjoy my summer months. 1. Take the time to meal plan for all three meals. It isn't necessary but it does help me to plan my grocery list and it is so nice to just look at the menu plan before bed to see what is on the plan for the next day. 4. Make sure to meal plan and shop on a day that works best for your schedule. I meal plan weekly on Sunday nights and shop on Monday mornings. You may be a biweekly planner or monthly. Just make sure it works well with your family calendar. 5. Plan for on-the-go lunches for working husbands or school kids. 100 Days of Real Food is a great place to find creative, easy and healthy packed lunch options. My son takes a salad with a protein for lunch every day and I just make sure to cook extra meat or hard boil some eggs for the week. 6. Work leftovers into your menu plan so you can cook once and eat twice. 7. Plan picnic-style meals and head to a park once a week for dinner and playtime with the family. Some of our favorite dinners are summer sausage, cut up veggies, fruit, crackers, cheese and a good piece of dark chocolate. 8. Use your grill and plan side dishes that don't need heat. Salads, cut up fruit and vegetables with dip are great ways to add nutrition and easy clean up to meals. 9. Keep your online recipes sorted well either in Evernote or my favorite is Pinterest. My last tip and one I really want to encourage you in is to just resolve to do it.